As a mom of two children, I remember both pregnancies pretty well, my first pregnancy I was very young & had a ton of questions & would of appreciated more advice. The second pregnancy seemed a little easier but I would of loved to of had access to a website like Pregknowsis.com. Pregknowsis.com is the perfect website for mom’s or women looking for information on trying to conceive, pregnancy & early parenthood. Pregknowsis is built by you, the community, you develop, post, answer poll questions & more! The answers & data are from you & other moms like you, Pregknowsis analyze’s the answers & makes it all meaningful for you! 1. A mom or parent goes to www.pregknowsis.com, creates a profile and answers a few lifestyle and demographic questions (age, diet, BMI, etc.). 2. Once registration is complete, you can go on and ask/answer their conception, pregnancy, or childhood related questions. Answers are instantly displayed using community answers in statistical form (individual users are anonymous). Once enough people answer a question, the answers become statistically significant (i.e. reliable) and gives users trustworthy information. 3. Answers can be taken one step further, to customization, by 8 different categories submitted in profiles. Users can then apply this to change lifestyle factors influencing fertility, from social drinking habits to BMI. So what do you think? 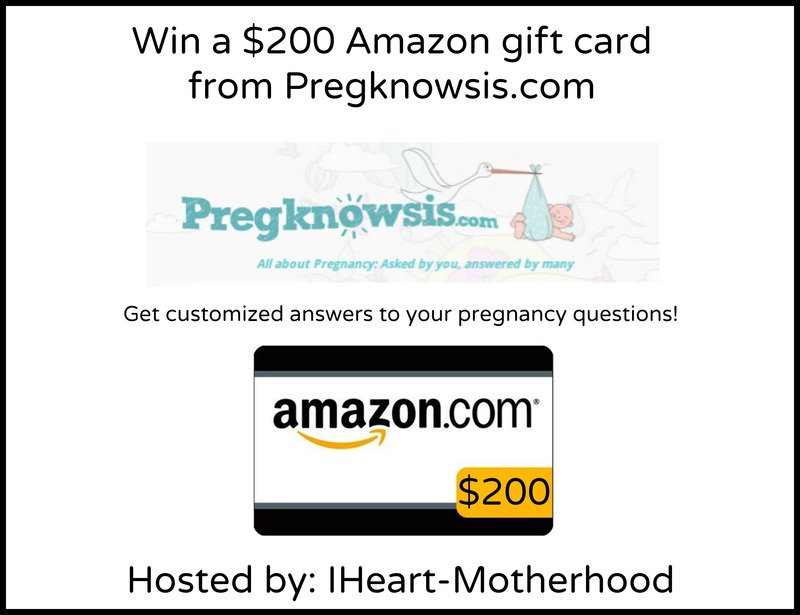 Are you ready to sign up for free at Pregknowsis.com & get customized answers? Connect: Be sure to follow Pregknowsis.com on Facebook & Twitter! Win: One lucky reader will win a $200 Amazon gift card! My sister in law is expecting in July and I would love to be able to buy her a baby carrier or wrap. She is a missionary and always on the go, so I know she would use this all the time.